Are you a new member to Congregation Or Torah? If you are renewing your membership, please select "No". Is there any conversion in the family? For new members, first-year family membership is $900. Please be aware youth groups are from 6 months- 5th grade. *Please note that children of members includes those who are still in school, live with their parents, or who are otherwise still fully dependent on the member parents. Requests for guest seats must be paid in full in order to be assigned. You can fill out this form again, but your Seating preferences for 2018-2019 HH have already been setup. To make changes to please contact the organizers. How much would you like to contribute towards your Building Fund obligation? The building fund obligation is a one-time obligation, of $3,500, payable over 5 years at a suggested $700/year beginning with the member's 4th year as a member. Participation in and payment of the building fund is required in order to be considered a member in good standing. Will you need to sign up your children for youth groups for the high holidays? Please be aware youth groups are for children ages 6 months to 5th grade! Where will the Mother/Guardian be davening? Where will the Father/Guardian be davening? Rosh Hashanah: How many children will be attending Youth Groups? Youth Groups Cost $10 per day on the High Holidays, for Rosh Hashanah the cost of groups is $20 per child. Yom Kippur: How many children will be attending Youth Groups? Youth Groups Cost $10 per day on the High Holidays, for Rosh Hashanah the cost of groups is $20 per child. For Yom Kippur, the cost of groups is $10 per child. Do any of the children attending groups on Rosh Hashana or Yom Kippur have allergies? If yes, please list them below. Please list any comments or details about your child(ren) that you feel would be helpful to us in making their experience enjoyable. Please note that you do not have to obtain approval from a member of the finance committee to pay half of your membership dues now and half in December. 1. Credit Card: To pay in full today please select "Paypal" next to payment method and click "Submit and Continue" below. You will be redirected to Paypal. You do not have to create a Paypal account to pay with Paypal. To pay as a guest, scroll down to the bottom of the page and follow the instructions listed. b. 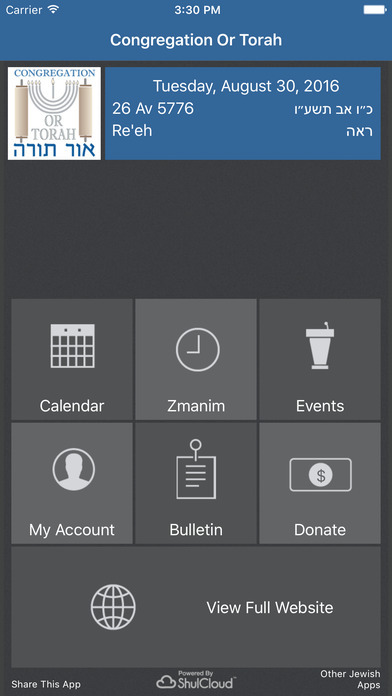 Next to the "Split this ", select "Two Payments"
NOTE: Although the system will allow you to choose to pay every few weeks or months, Or Torah will only process your payment when you select "Every 5 Months". We will contact you if a mistake has been made so that we may rectify it. Please also note that in order to split your payment, you must create a Paypal account. This is similar to registering for an email address on Gmail or Yahoo. The credit card you use to make your first payment will be re-charged exactly 5 months from the day you make your first payment.